This topic contains 0 replies, has 1 voice, and was last updated by ADDIE 1 year, 1 month ago. In upper-level classes, it can be pretty easy to create learning activities that are engaging; the foundations of a discipline have been laid and students are ready to begin applying, analyzing, synthesizing, and evaluating what they have learned. These learning activities mirror the complexity of higher thinking skills and present challenges and opportunities for elaborate reasoning. They also offer possibilities for meaningful interaction with peers, instructors, and content. However, developing engaging learning activities for beginning-level courses is more challenging as the cognitive focus tends to be on recall, recognition, and description – tasks that students tend to find boring. Flashcards, study questions, practices quizzes, drill and practice exercises, concept matching, etc. are effective in addressing the lower levels of Bloom’s taxonomy (knowledge, and comprehension) but are not usually very engaging. Too, these activities decontenxtualize concepts and limit opportunities for making real-world connections and develop deep learning. Any ideas? We appreciate any insight you can provide! Jesse has posed a great question that is going to ring a bell with a lot of faculty: how to cultivate students’ higher order thinking skills in beginning courses. Part of this challenge lies in the traditional role of foundational courses—to impart the basic facts of the discipline, usually identified as names, timelines, terms, dates, labels, and norms. While this information is critical to students’ success as they embrace a new discipline, relying on traditional approaches (i.e., rote memorization) to learn the material can be off-putting to students who may have limited experience with memorizing large amounts of material and, more importantly, does little to cultivate their higher thinking skills. This rote memorization approach does not inspire students to engage with the material, as the information, while perhaps meaningful, is not presented in a way that is meaningful for students. A powerful approach to cultivating higher-level thinking in all course levels is the constructivist approach: students become active participants in constructing their own knowledge and, at the same time, analyze, synthesize, and evaluate their own knowledge. Examples of activities that foster higher-level thinking include reflection activities, online discussions, peer review, and small group activities and projects. While establishing a core foundation is important in a beginning course, establishing the facts within a context is a strong way to enhance understanding as well as memory. When students are prompted to use higher order thinking skills in a way that they can relate to, they remember the lower level information with more motivation. 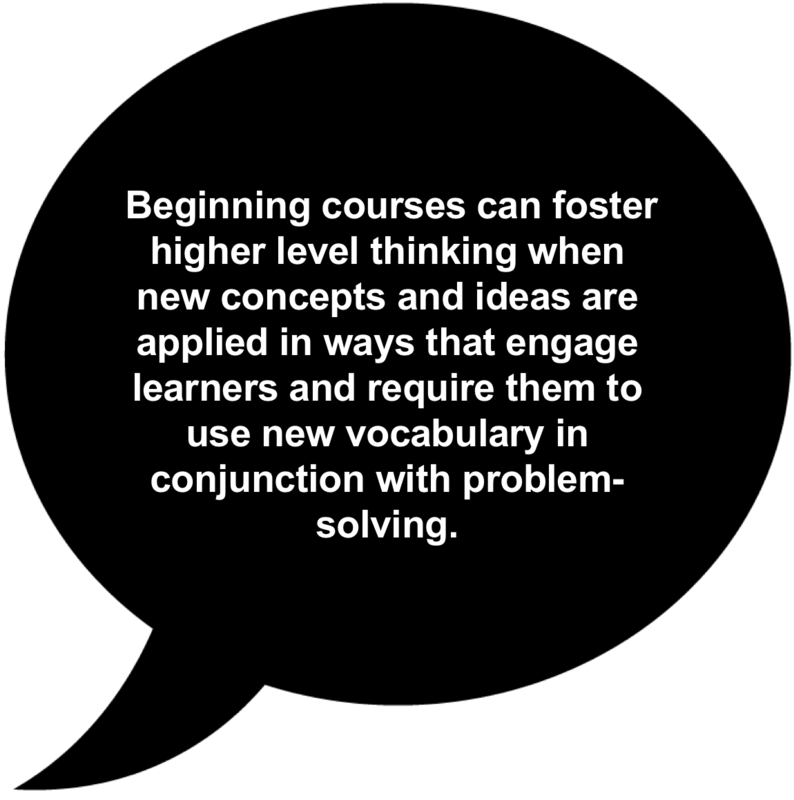 Something else to consider is this: beginning courses can foster higher level thinking when new concepts and ideas are applied in ways that engage learners and require them to use new vocabulary in conjunction with problem-solving. There are lots of resources available to instructors and instructional designers who want to develop activities that foster higher thinking skills. The University of Wisconsin-Madison’s (2016) Online Course Design and Thinking web page offers suggestions related to putting into practice the goal of creating interactive assignments that require students to think. Two of the most powerful suggestions include the following: (1) allowing enough time for collaborative or group activities and discussions and (2) select learning activities that accomplish objectives (para. 4). For instructors who have a robust list of learning objectives, allowing students to have the time to engage in deep thinking can be the biggest challenge. For example, a discussion or group activity may take more than one week to complete if higher thinking is involved. Another source of information regarding engagement and the adult learner can be found on the TOPkit website under Use Techniques that Complement the Adult Learner. In online courses, cognitive presence has an important role in engaging adult learners and preparing them to tap their higher thinking skills. Cognitive presence is the extent to which instructors and students can construct meaning through discourse within a community; in this case, the community is the course. Cognitive presence creates an environment in which learners can solve problems and come to a consensus. TOPR has some resources for fostering interaction (https://topr.online.ucf.edu/interaction/) and assessment (https://topr.online.ucf.edu/assessment/). An instructional designer can play a vital role in helping faculty develop assignments that cultivate higher thinking in their students. Assignments that tap students’ higher thinking skills have the added benefit of engaging faculty more deeply as well, challenging them at the course-design level as well as at the course-delivery level. In addition to facilitating the development of instructional activities, the instructional designer can connect the instructor with additional instructional resources, including collaboration tools (e.g., Google Drive) and web conferences (e.g., Big Blue Button). Going forward, something to consider is this: how can we engage all students, and not just those students who are already motivated and engaged? This question is particularly challenging in an online environment where you do have the non-verbal cues of engagement, and it’s easy for students to move through a course while only skimming the surface of what the course and the instructor have to offer. We hope this answer is useful to you but I hope the TOPkit online community may have other suggestions or questions. What are some other ways we can encourage our students to go deeper?